Godalming a market town in South West Surrey has a long history. The presence of Mesolithic and Neolithic flints points to human activity here in prehistoric times. Also, remains of Roman pottery suggest Roman occupation nearby. The pretty town was already a large busy village in Anglo Saxon times. Then, King Alfred left the village in his will to his nephew, Ethelwald. The area grew wealthy during the middle ages on the wool trade and later the leather tanning and paper industries. Early industry here was powered by watermills. Queen Elizabeth I made Godalming a Borough in January 1574. And, in 1881, the town was the first in England to have a public electricity supply. With such a long history, it is no surprise that the town has five conservation areas and 350 listed buildings. 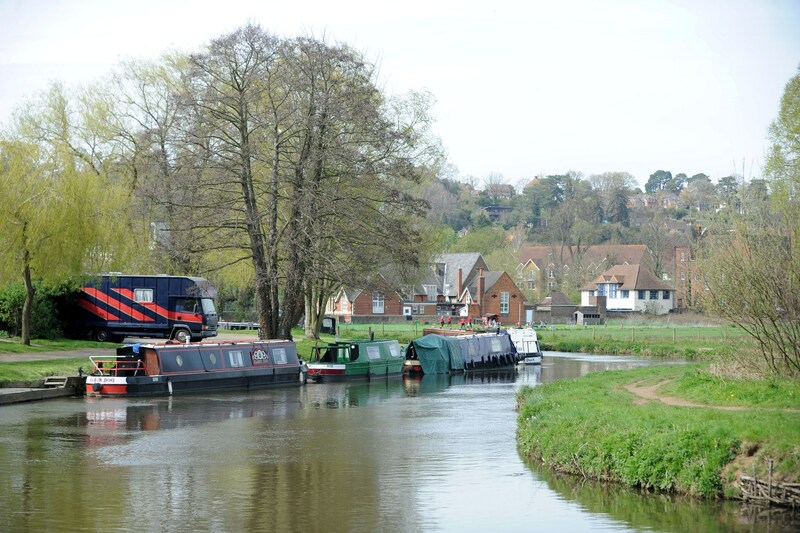 Built on the river Wey, the town’s water meadows, the Lammas Lands, are an attractive natural feature of its landscape. The industrial revolution brought hardship to the town as wool production shifted to the industrial West Riding of Yorkshire. The town had already started to suffer with the plague of 1636-7. It remained a centre however, for stocking making and paper production. During the years of coach travel, Godalming became an important staging post on the route from London to Portsmouth. The Kings Arms, in the High street, was a coaching inn from 1753. In 1689 the Tzar of Russia, Peter the Great, rested at an inn on the same site and apparently left without paying his bill. John Perry built the Town Hall here in 1812. The ground floor was a market place while the business space was upstairs. The building still stands in the High Street, no longer the Town Hall; it is called the Pepper Pot . Situated at 109 High Street, behind a blue door, is the Museum. The Museum building is behind the Georgian brick frontage. It is a timber framed building dating from 1446. That building itself includes an earlier building from 1400, making this the oldest house in Godalming. The Museum is open from 10 – 4 and has a number of galleries, a local history library and a coffee shop. Additional hours are possible by arrangement. 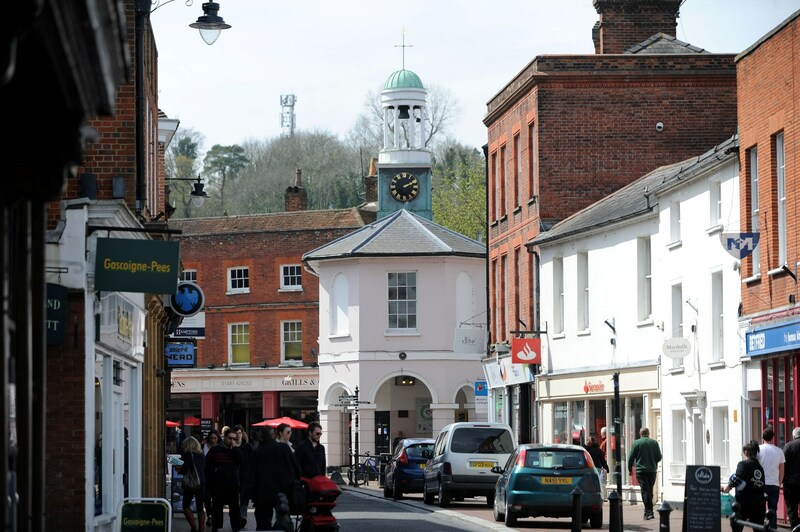 Modern Godalming in south west Surrey, 7 miles from Guildford, and 30 miles from London, is in the commuter belt. Hence, today most people earn their livings outside the town. 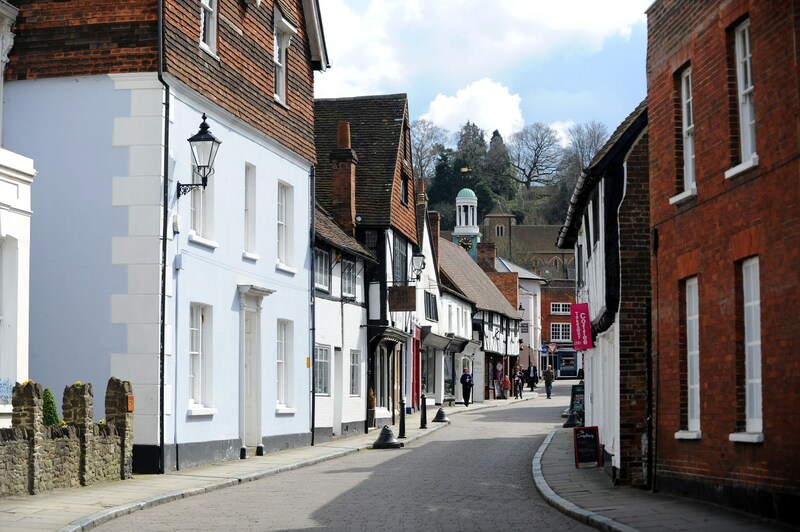 If you’ve been to Godalming, please tell us what you enjoyed. Previous PostHailsham, in the Wealden District of East Sussex, at the gateway to the South Downs National Park. Next PostWitney a beautiful ancient market town in the Oxfordshire Cotswolds.